Would you like to hear your children spontaneously quoting stanzas of poetry? (Real, meter-and-rhyme verses about real things?) I know I do! And when certain poems become a part of your family experience, quoting snippets at each other can be like an affirmation of love. What surprises me into gratitude is how easily – not quite accidentally, but with very little stress – it happened for my family. Now poetry, like calamari, is not for everyone, so don’t add this to a list of things good parents should do. And I think a love of poetry is more alchemy than science, so I’m not claiming that we discovered a guaranteed process. 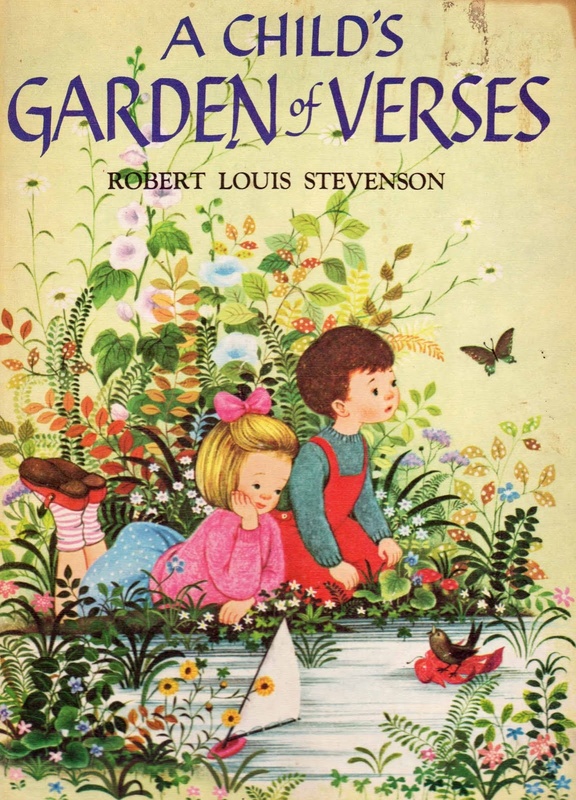 But my family owes much to the beautiful collection, A Child’s Garden of Verses, by Robert Lewis Stevenson. We hardly ever visit a playground without hearing that poem a couple of times! Now if, as Roger Housden argues, poetry is valuable because it gives us fresh eyes, then it has the potential to call forth wonder and gratitude for the smallest things. And the poetry of Robert Lewis Stevenson does exactly this for the smallest people. We have this collection, but we haven’t really memorized entire poems yet. I’m curious as to what “not quite accidentally, but with very little stress” looks like in practice. Did you just read them to your kids over and over? Or did you focus on one particular poem for, say, a week? Do you have them purposefully memorize them and recite them, or just kind of listen to them enough times to say it on their own? “The Swing” makes an appearance in an early Rocky & Bullwinkle episode. Maybe I need to revisit those. Allison – You can print the poems out individually, using a nice font and leaving wide margins. As you read to your children, let them draw and color in the margins whatever comes to mind. It helps them engage the senses as well as the mind, so connections take place more easily. It also gives you a peek into what they’re hearing/seeing. Choose your favorites to frame for a gift, for their room, etc. or put them together in a book. They can make wonderful presents for grandparents. Julie, very cool. Thank you! I am exceptionally relieved to know now that calamari is not for everyone. If I had to choose between calamari and poetry, I’m fairly sure I’d choose poetry. I’ve heard my son quote a line he liked from an opening poem of his “High Five” magazine. So that’s a good start. Ha! I’ll take poetry and calamari (extra hot, with extra garlic) when I can get it. Neat that your son is showing interest on his own. Have fun with it! This is one of our family’s favorites! Our copy has really lovely illustrations by (I think I have this right) Johanna Isles, and my daughters got into the spirit of things and composed a collaborative poem about the rear jacket illustration. You know it’s good poetry when you want to close the book to go off and compose your own poem. Count me among those who had this edition growing up and loved it! I’m sad it fell off my radar when my own kids were younger. I did not grow up with poetry and, like many others, felt intimidated by it for the longest time. But I stumbled upon the Facebook page of Julie Bogart one day, and before I knew it, I was gathered around our dining table one afternoon, conducting my family’s very first “Poetry Teatime”. Did it appeal to me? Yes. Did I think it would actually work? Not a chance. But…it did! It has become a beloved pastime for all four of my school-aged kids, and the routine is simple: brew a pot of tea (or coffee…or hot chocolate…or all three…), set out a plate of treats, and lay out a stack of poetry books. While the tea is guzzled and the treats are consumed, everyone takes turns thumbing through the poetry books and reading selections aloud. I can’t believe how fun it is, or how long the children will sit there, reading just one more poem! I’m still slightly intimidated by poetry, but of all the poets we’ve read, Robert Louis Stevenson is my favorite. He pinned down childhood, for sure, and I am sure that his works will prick me with that painfully beautiful sort of nostalgia when my children are grown.